Since we started our sponsorship of Chetham’s Symphony Orchestra in 2011 the school has expanded its performances to major venues in London and Manchester. As part of the Britten centenary, the Chetham’s Symphony Orchestra performed a selection of works by Britten, Prokofiev, and Shostakovich at the Royal Northern College of Music and Cadogan Hall in London on 21 and 22 February. The atmosphere and quality of the music at both events was outstanding and it is clear from the comments made by the guest conductor Paul Mann that he had thoroughly enjoyed his time with the school. Alan Torevell was fortunate enough to be at both performances, with Martyn Torevell joining him for the London event. 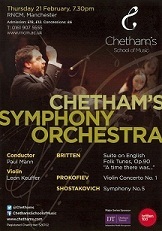 Chetham’s Symphony Orchestra is performing at the Bridgewater Hall in Manchester on Friday 5 July and at the Cheltenham Festival the following day. On 14 July, Chetham’s School has its first ever concert at London’s Wigmore Hall featuring a number of Chetham’s alumni and winners of the BBC Young Musician of the Year Award.